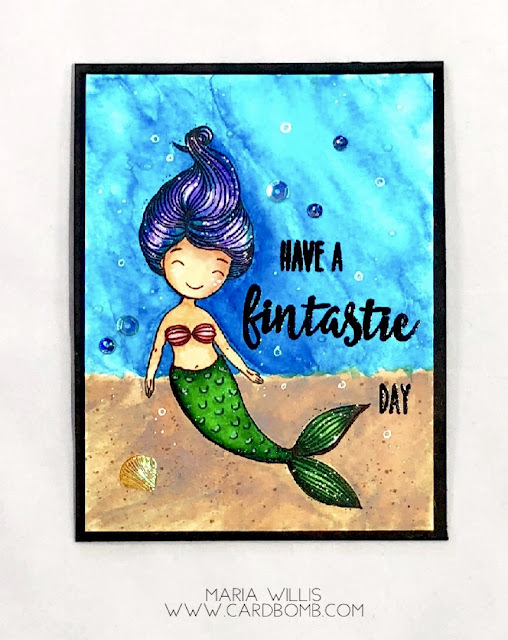 Cardbomb: Honeybee Mermaid: Have a Fintastic Day! Honeybee Mermaid: Have a Fintastic Day! Hey Everybody! 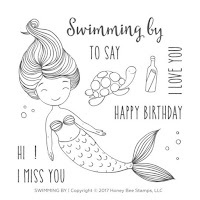 I'm here today with a quick post. 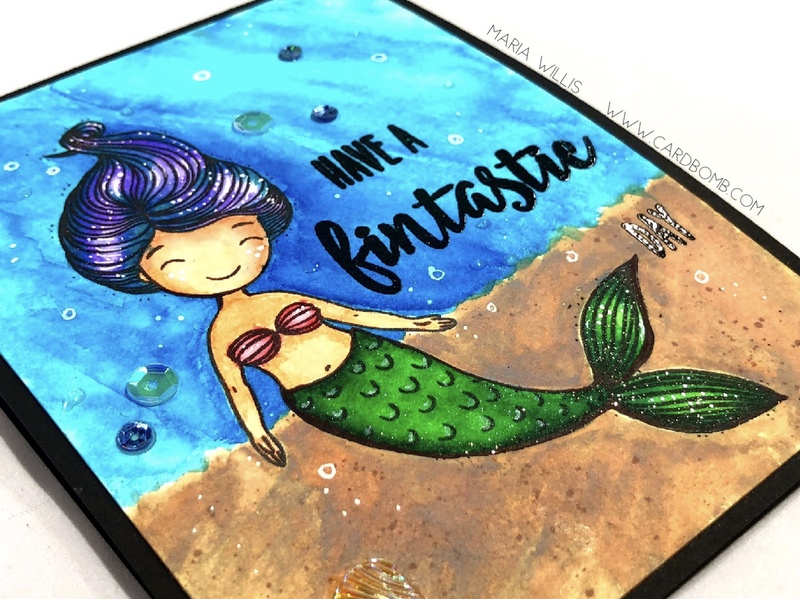 I finally had time to get back into my craft room last night (think VERY early this morning) and I had a little fun with this gorgeous mermaid from the Swimming By stamp set from Honeybee Stamps. I also used my new Arteza Real Brush Pens for the first time and I love them! I started out with the Mermaid's tail and used two green markers and a blue to get some fun shading. 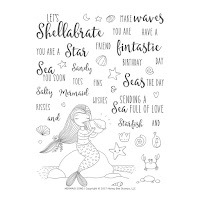 Then I moved on to her skin and shells. For most of the card I applied color directly to the watercolor paper with my Arteza Real Brush Pens and then I used a water brush (paint brush with a water-filled barrel) to blend the colors. I did her shells a little differently as the red color that I wanted to use was a bit bolder than I wanted it to be. I colored the red ink onto a piece of acrylic. Then I used my water brush to pick up the color and paint it onto her shells. It worked perfectly to dilute the color. I wanted a little extra shading on the sides of the shells so I went back in with my brush pen, added a little color directly to the edges and then blended it with my water brush. It worked the way it was hoping I would and I love how versatile these pens are. 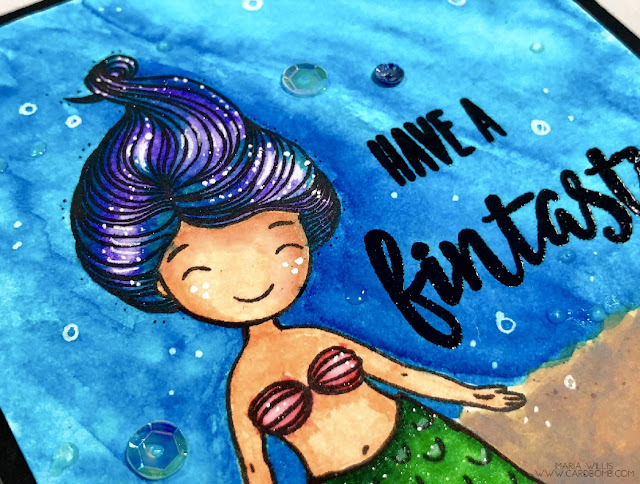 My favorite part to color on this mermaid was her hair. I'm a little obsessed with mixing and blending odd colors right now and for her hair I picked two purples (light and dark) and a teal green color. They blended together to make some really fun shades of purples, blues and greens. I laid down the color first, then blended making sure to leave the highlighted areas with less pigment. After watercoloring I went back in and added more color where it was needed. I painted my background using both my Arteza Real Brush Pens (two blues for the water) and Distress Oxide Ink in Frayed Burlap (sand). Then I heat embossed the sentiment in black (sentiment is from Mermaid Song by Honeybee Stamps). I finished off my card by using a white gel pen to add highlights and details to the mermaid and background and glueing on some sequins from Hero Arts. That's it for today folks! 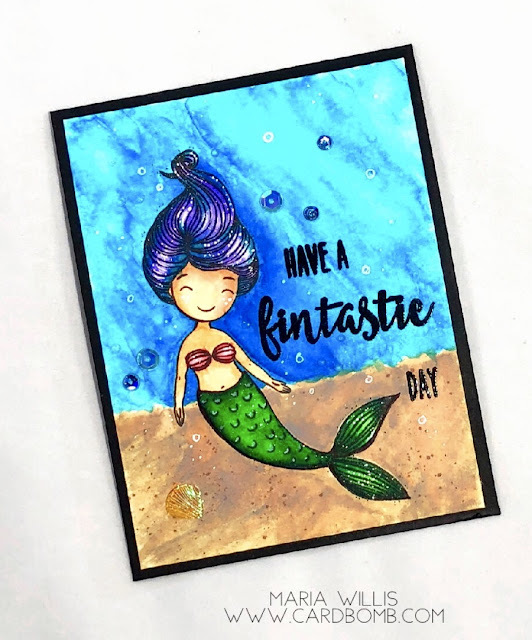 Just in case you'd like to pick up a set of these amazing watercolor markers or one of the stamp sets I used for this card I will add some links for you below. If you have any questions please shoot me an email or leave me a comment below. New Distress Oxides are Available Now!